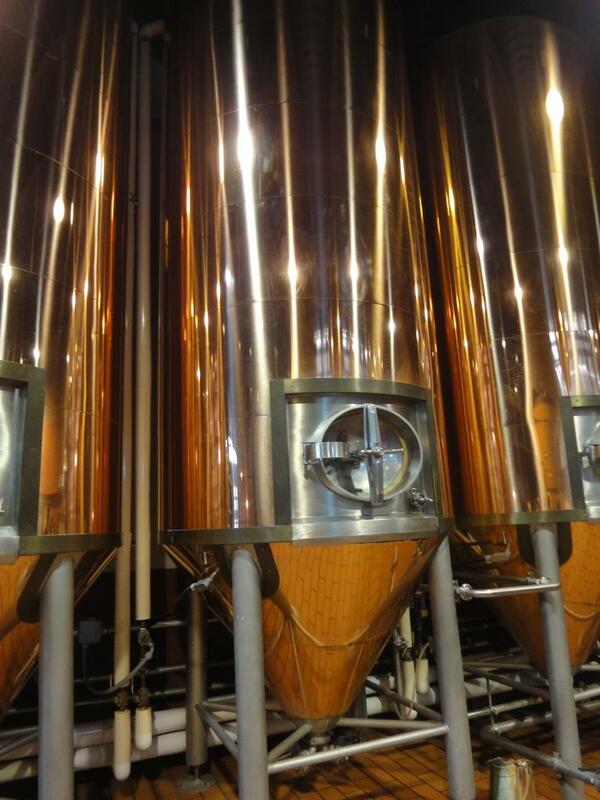 And what trip of mine would be complete with a brewery tour? None. After breakfast at Shaw’s, we headed back to Halifax and signed on to the first tour of the day at Alexander Keith’s brewery. 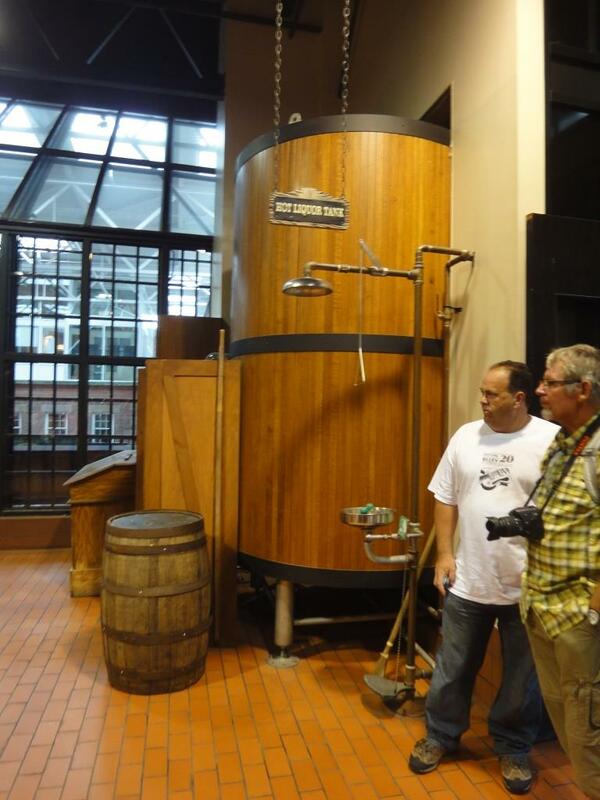 The tour took place at the site of the original brewery and much of the compound had been kept intact. 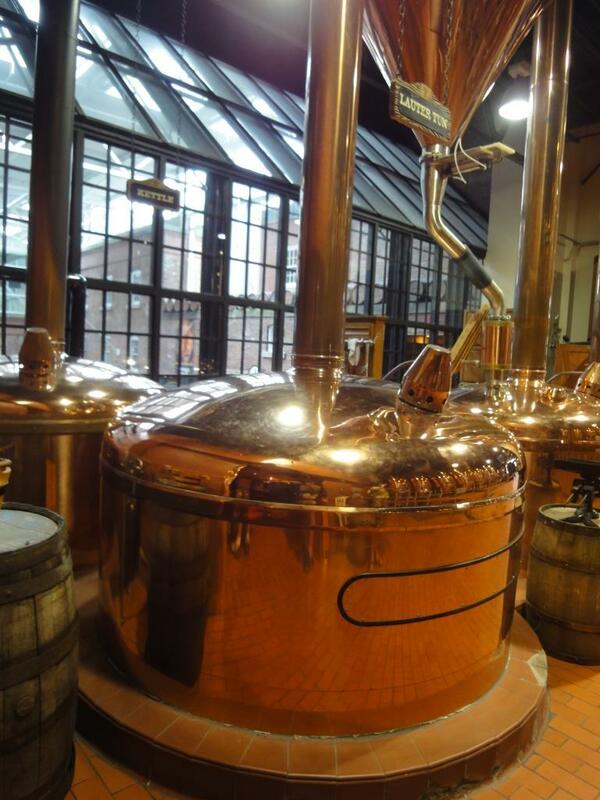 Unlike most brewery tours, this was of the original brewery and was more “drinking theatre” than a tour. Actresses in period costumes led us through parts of the building under the guise of meeting “Mr. Keith” who kept getting delayed. The equipment didn’t appear to be in use, but the copper shone brightly and distracted me from the theatre. It was a little corny, but enjoyable none the less. 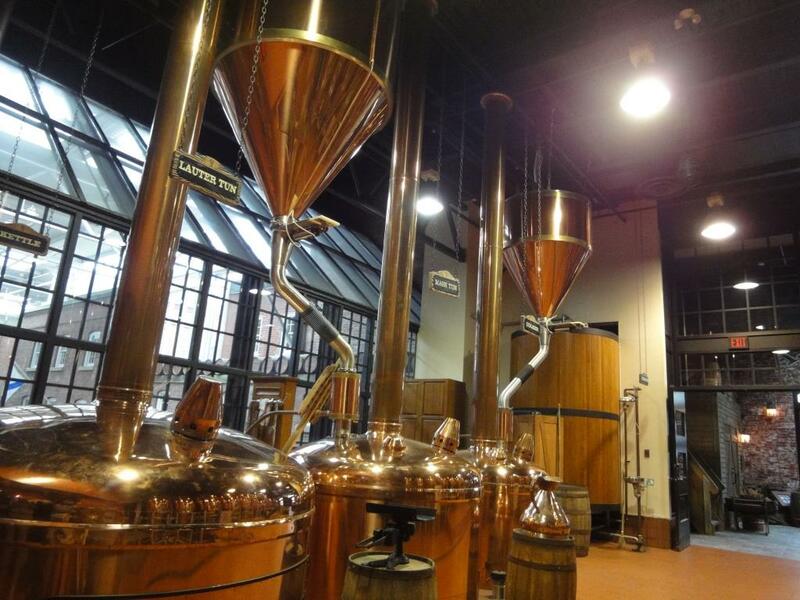 Left to right: boiling kettle, lauter tun and mash tun. Then it was on to the airport to drop Zeke and Christina and time for me to head for home! From Lunenburg, we drove east towards Peggy’s Cove. 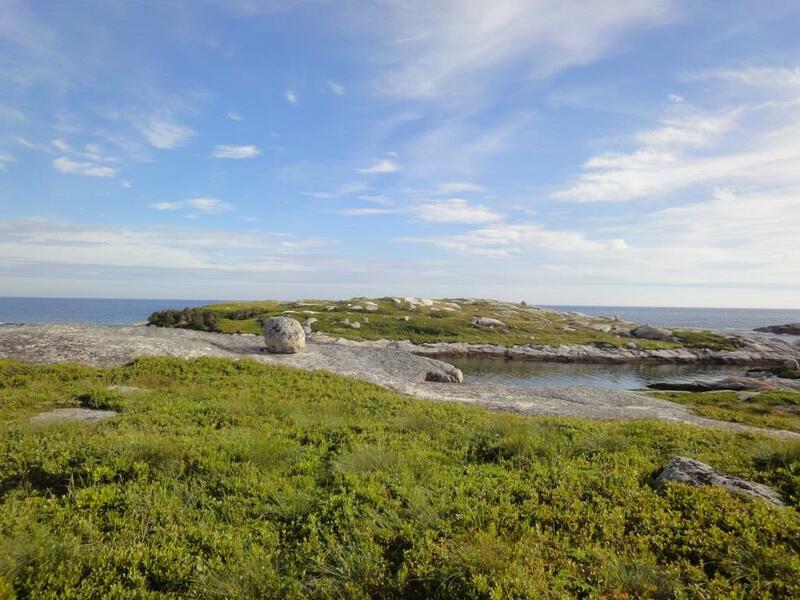 The road wound along the rocky coast, past Peggy’s Cove to West Dove. It reminded me of Newfoundland with more money. 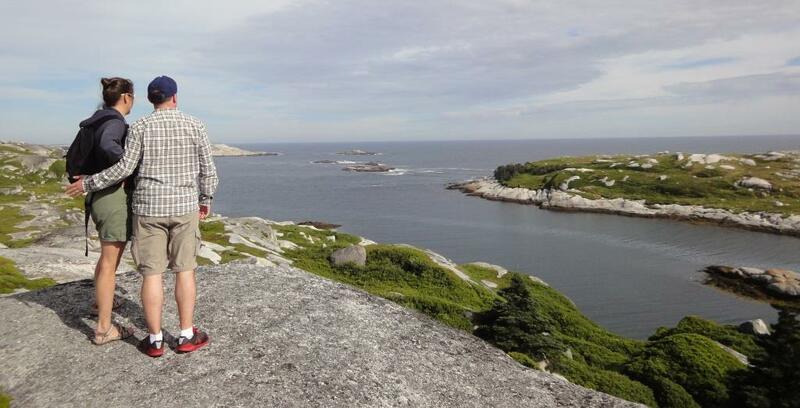 We checked into the B&B, then hiked out to Polly’s Cove. The photos speak for themselves. After returning, we walked a couple hundred meters down the road to Shaw’s for a lovely seafood dinner. 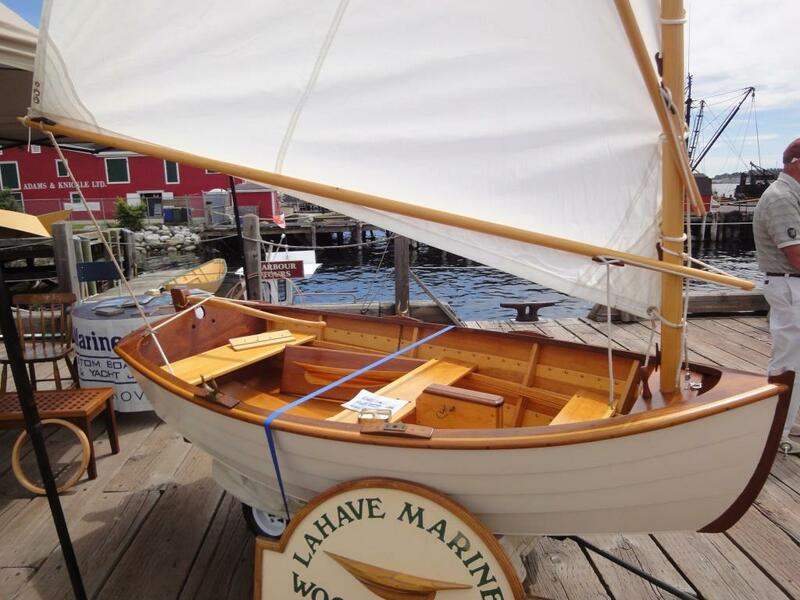 We left Dartmouth Sunday morning to go to Lunenburg and the Peggy’s Cove area. We were shocked to find out the Christina had never been to a Tim Horton’s! Shocking! This coffee chain started by a famous (in Canada) hockey player, the franchise might be more ubiquitous in Canada than Starbuck’s or Dunkin’ Donuts in the US. So of course we had to start our day with Tim. 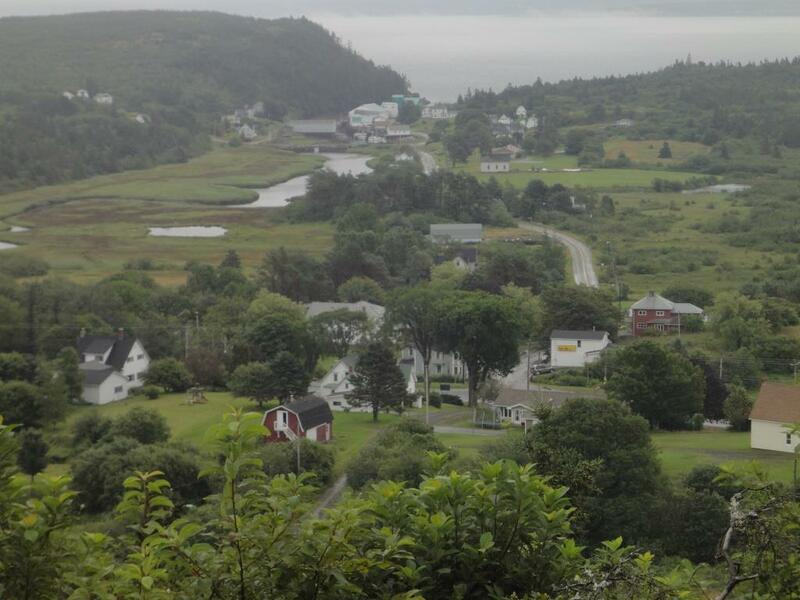 Fortified with Tim’s coffee and breakfast sandwiches, we drove west towards Lunenburg. The geography in that direction is striking: the trees are much smaller and the rocks are much more prominent. Stan Rogers used the line, “Where the earth shows its bones” and it’s apt. 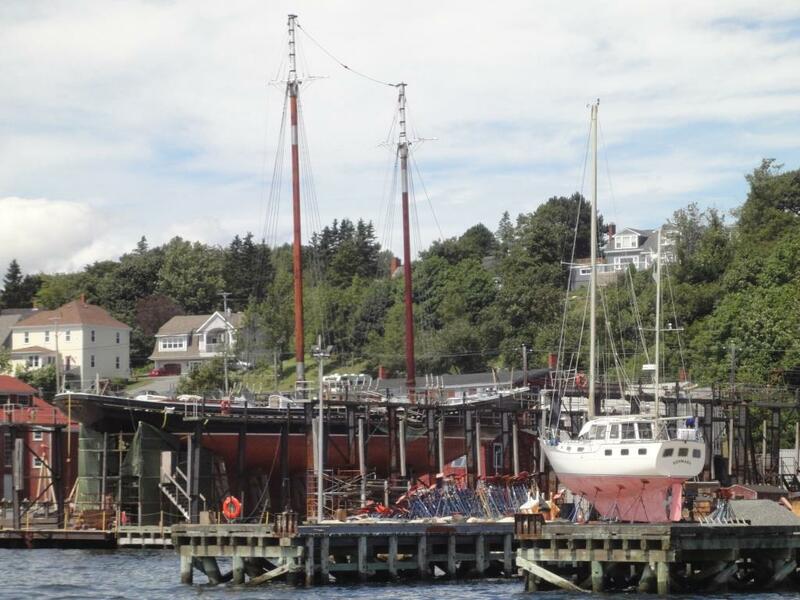 Lunenburg itself is a UNESCO World Heritage site. The colors of the buildings are, in my opinion, vibrant without being annoying. 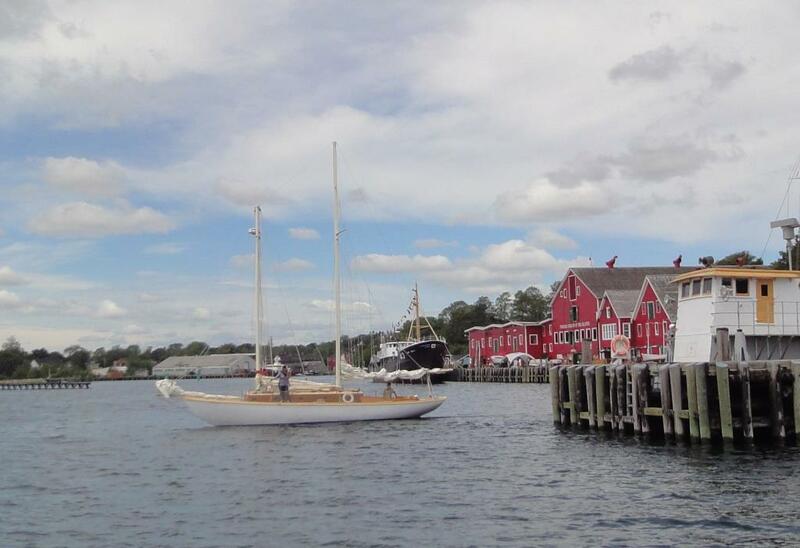 to the “Bluenose II,” most associated with Lunenburg and in dry dock for a major overhaul. After some delicious homemade ice cream we boarded the Eastern Star and took a lovely cruise in the harbor. The captain was a quiet guy who managed his young crew with care and humor. Passengers were invited to help haul up the sail (which I did) and take the wheel. The tour included a little of the history of the place including the obligatory disaster: the raid on the town by privateers. I was joined for the last weekend of the trip by Zeke and Christina. It was just great to travel with them! Zeke and I had some adventures together in the Republic of Georgia and the Yucatan and Christina knows Zeke well enough to expect the not always riveting conversations Zeke and I get going on…so she got a little more sleep than we did. We started our Saturday afternoon in Halifax with a lunch at the Henry House with Jen Clarke. More great Nova Scotia seafood with the pleasant addition of local microbrews was had on the porch of a building constructed in the 1700’s. From there we walked along the waterfront taking in the sights. 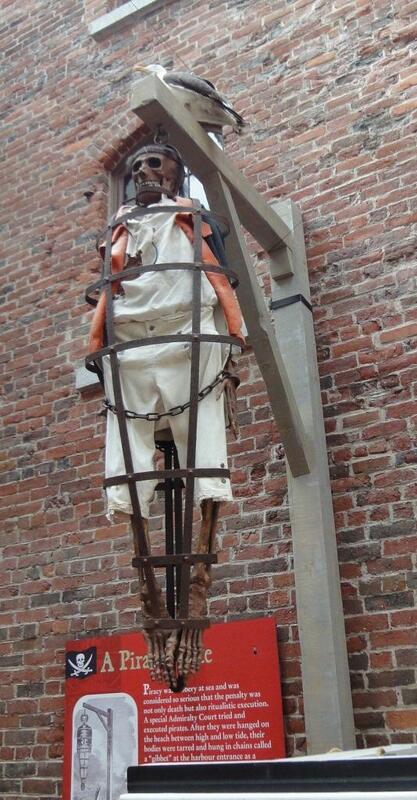 The Maritime Museum was a huge and interesting place. 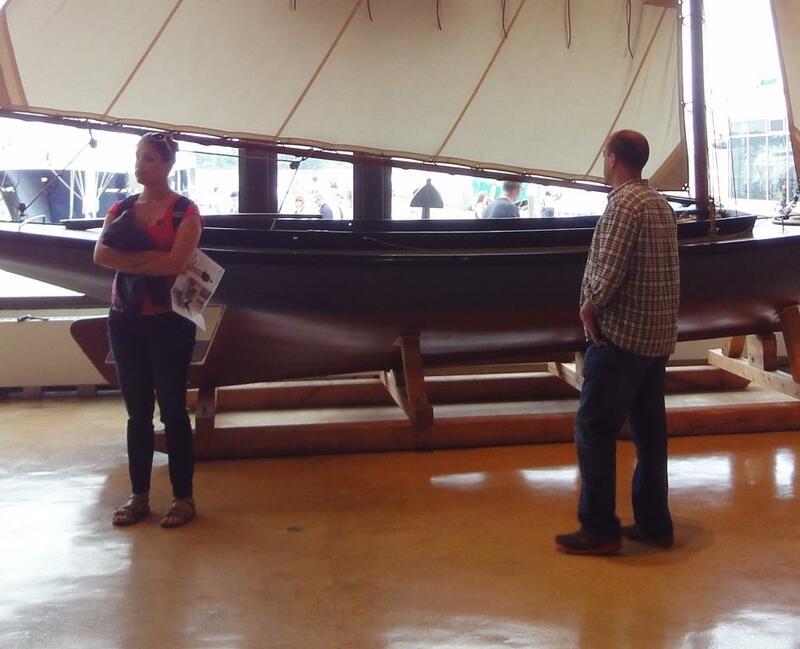 In addition to the exhibits inside, there was a retired research vessel, the Acadia, moored in front for tours (included in the admission price). As noted earlier, there were the exhibits about the Titanic and the Halifax munitions ship explosion. We checked into our hotel room across Halifax Harbour in Dartmouth and took the ferry back across to cruise the waterfront for dinner. Unfortunately the Bicycle Thief, our restaurant of choice (thanks to Jen!) had an hour wait and at least one of our party couldn’t wait that long (nor did the other want to). We settled on the Seafood Warehouse. Now I am by nature skeptical of most anything with “warehouse” in the name, it conjures up pallets of the stuff—and the only think I like to get on pallets is usually made of cast iron and goes in my shop. Adding to my skepticism was the fact that there wasn’t a wait. In this case my low expectations led to a good experience. The food wasn’t Lavena’s but it wasn’t bad. Making our way back to the ferry, we took the ferry back over to Dartmouth and decided to stop in the “Celtic Corner” pub near the terminal. What a treat! 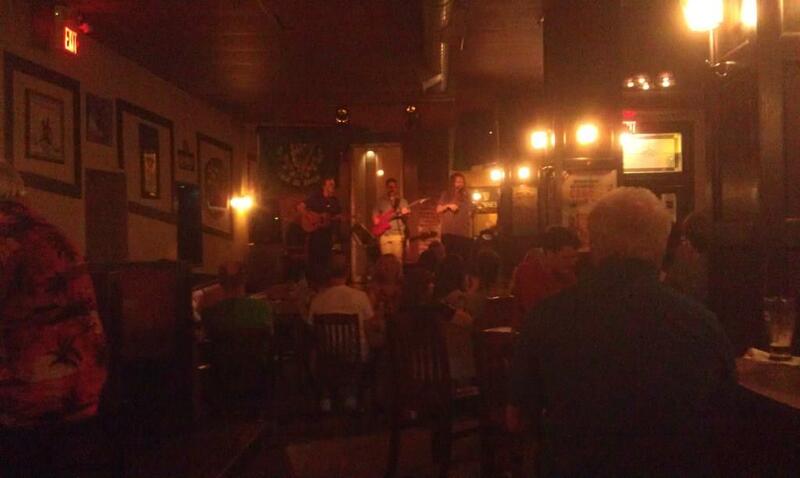 There was good food and beer, but the high point was the local Celtic band and the enthusiastic audience. It really reminded me of Scotland and Ireland. may your mountains dark and dreary be. Will you ever heave a sigh or a wish for me? On the surface, Nova Scotia is a happy bustling place, but scratch the surface and there is a depressing tale about to erupt. At first I chalked this up to the dourness of Scots’ Calvinism, but when I visited Grand Pré, I found another sad tale emanating from the French history. In the mid 1700’s the British rounded up all the French living in Grand Pré and deported them to various parts of British territories in the New World from Massachusetts to Louisiana (“Cajun” is a bastardization of “Acadienne”) to the Caribbean. Then they burned their houses and farms. Many died of sickness on the ships. In the video production they talk about how hard life was in Grand Pré—building irrigation dikes, building houses that would withstand the winter winds, etc.—then being taken away from it after they had made it their own. “We are no longer French, we are Acadian!” Some managed to hide and stay with the local Mi’qwak Indians and others managed to find their way back to the area, highlighting their diligence and pointedness of mind. The Miners’ Museum in Springhill was a monument to the 74 miners and rescuers killed in the Springhill mining disaster of 1958. The museum itself was upbeat and positive. They focused on the heroic efforts of the rescue teams (Drägers, named after the inventor of the 50 lb respirators they wear) and ran a short CBC documentary made on the 50th anniversary in 2008. Similarly, the Inverness mining museum focused on the life and times of the miners, but did highlight the fact that the tunnels in the Inverness mine were so low that miners often spent the whole day working on their backs. The lovely young docent also talked about the children working in the mine and their first job of taking care of the “pit ponies.” These ponies hauled the coal out of the mine and were born, raised and died in the mines, and so could see in very low light. If they ever got outside, they would go immediately blind, so the main job of the children caring for them was to keep them from getting out. Visiting the Maritime Museum in Halifax, there were some great exhibits about local ships but the thematic exhibits were about the Titanic (Halifax was the closest port and most of the survivors—as well as the recovered bodies—went through it) and the explosion of a munitions ship during WWII. In fairness, the later was a truly spectacular tragedy: hundreds of lives were lost, blocks of the city were destroyed, a 500 lb cannon was thrown 5.5 km and windows were shattered 100 km away. And few Americans know about it. 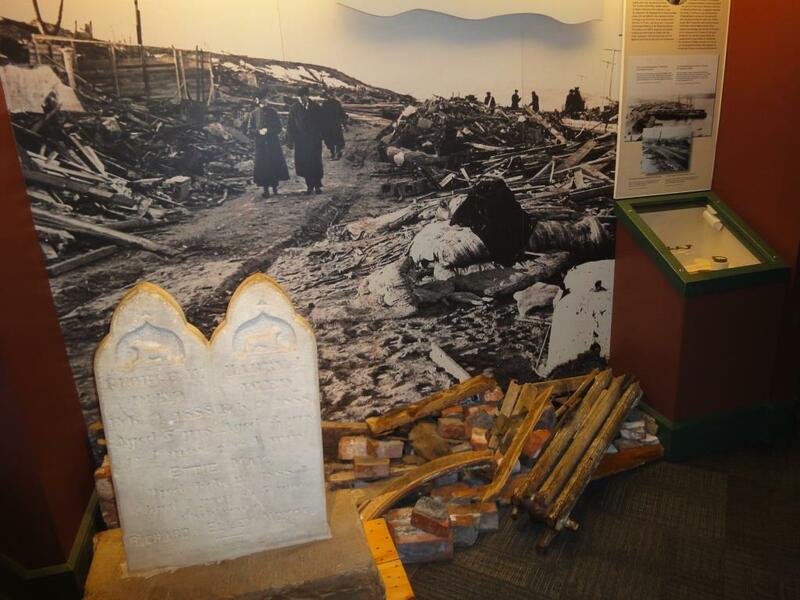 Don’t get me wrong, the tales of woe, mistreatment and disasters of deportation, mine collapse and shipwreck are real—and US history contains plenty of the same kinds of things—but here in Nova Scotia they are placed front and center. Anyone who has ever lived on the sea or even read books about the sea, you know tides are important. In the Bay of Fundy, the tides rise and fall more than anyplace on earth. As I noted in the post on tidal energy, they estimate that the flow in the Bay is equal to 4 times that of all the rivers in the world. The water level changes 25 and more in places. 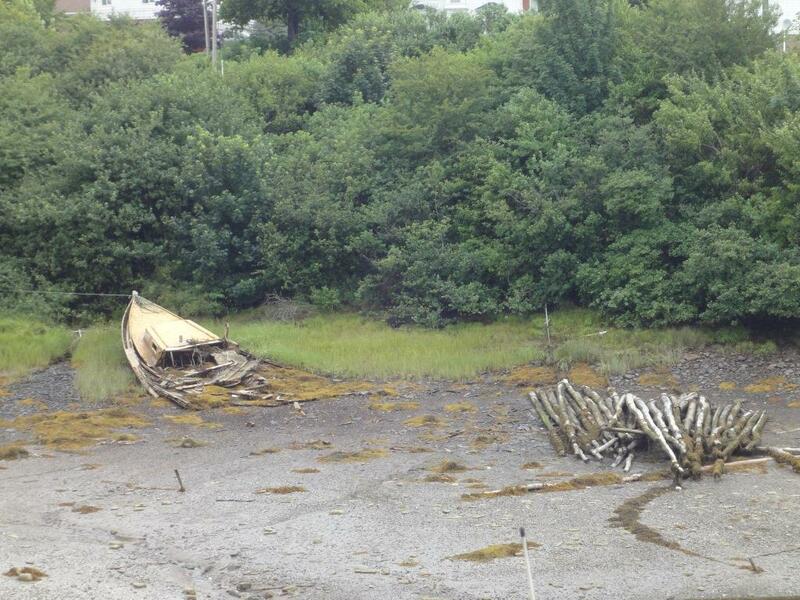 The photos below are taken in Sandy Cove are taken about 4 hours apart. Digby near the mouth of the Annapolis River which runs SW, broadens out to form a bulbous pond, then exits to the sea through a small gap to the NW. 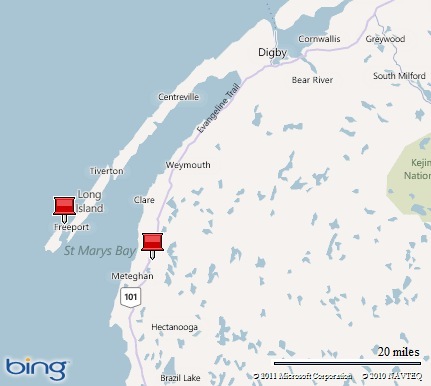 To the SW of Digby, St. Mary’s Bay is bounded on the NW by Digby Neck, Long Island and Brier Island. 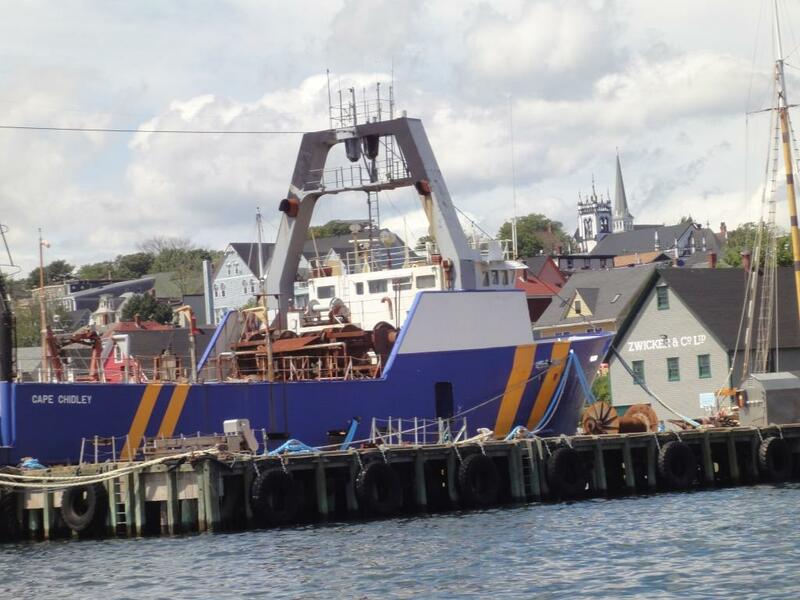 Ferries connect Long Island to the mainland and Brier Island to Long Island. 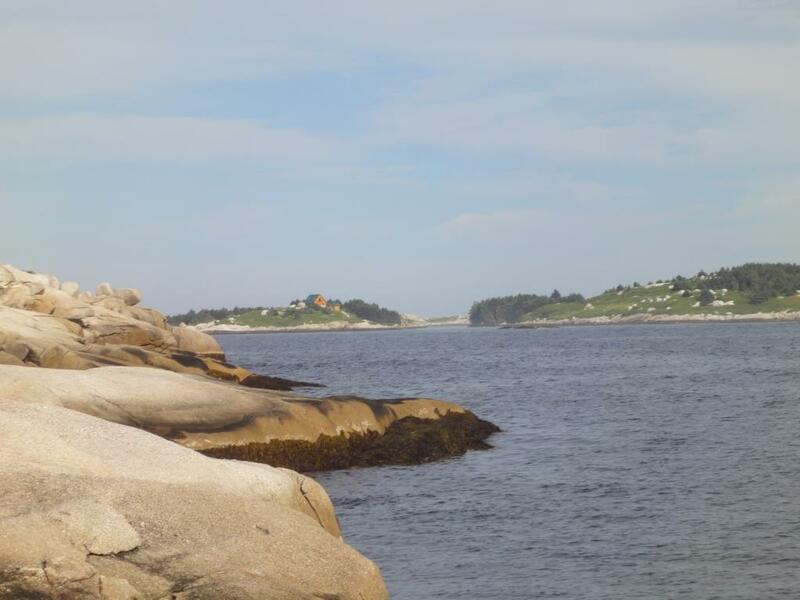 Along the neck are little harbors, rocky headlands and sand beaches. And one of the best restaurants I went to on the trip. The lovely people at the hostel showed me several great places to go and I wish I’d had another day to do more there. The first place I stopped was Sandy Cove. 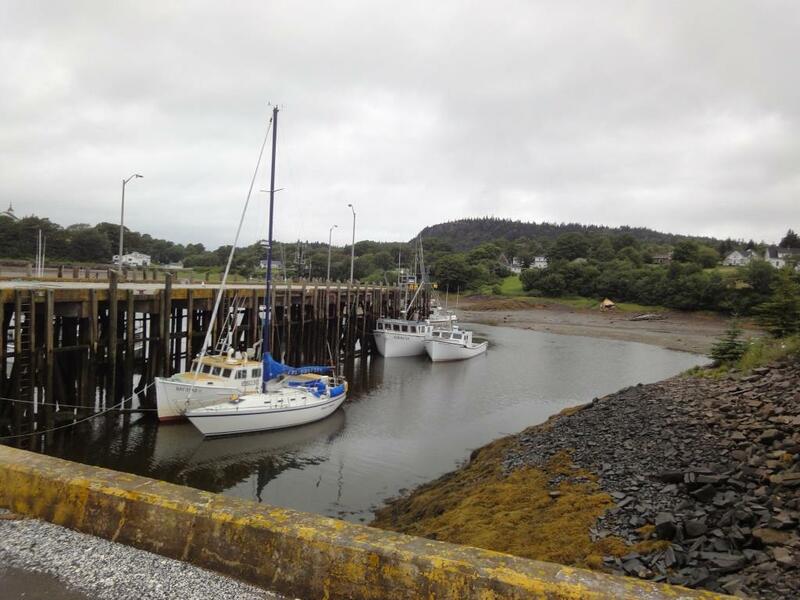 The village of Sandy Cove has a lovely little harbor and a small fishing fleet. On the north side of the neck, there is a long, broad sandy beach with a great story on the sign about the Mysterious Man. There was a plaque telling the story, but when I went looking for the story on the web, I found there are many and conflicting stories of the Mysterious Man. 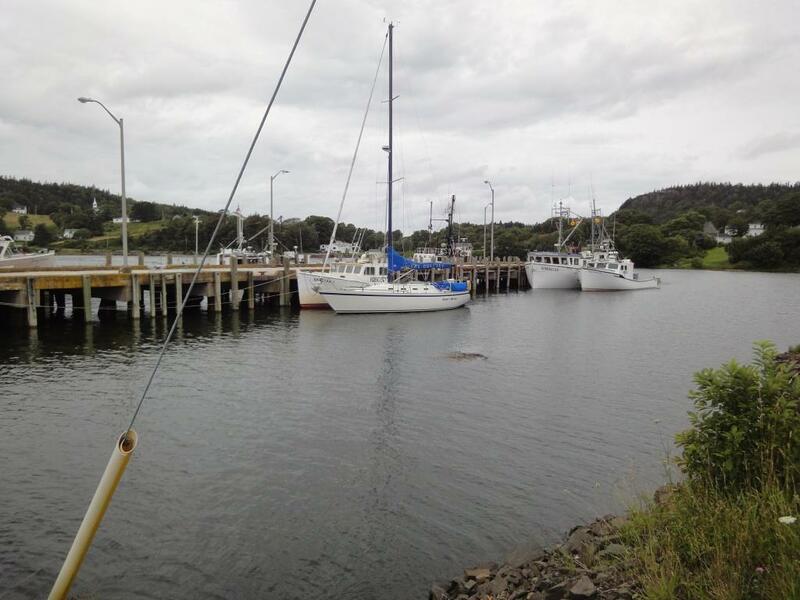 The assertions that seem to occur in many of the stories are that there was foreign ship that came up the bay but was gone in the morning and that a young man with freshly amputated legs was found on the shore of Sandy Cove. He was taken care of by several different families and there are records that show that the families were paid by the local poor master to do so. The man did not speak English and refused to talk much at all. Despite numerous attempts to determine who he was, none seemed successful.There is speculation that he was Italian from Trieste as he became agitated at the hearing of that place. 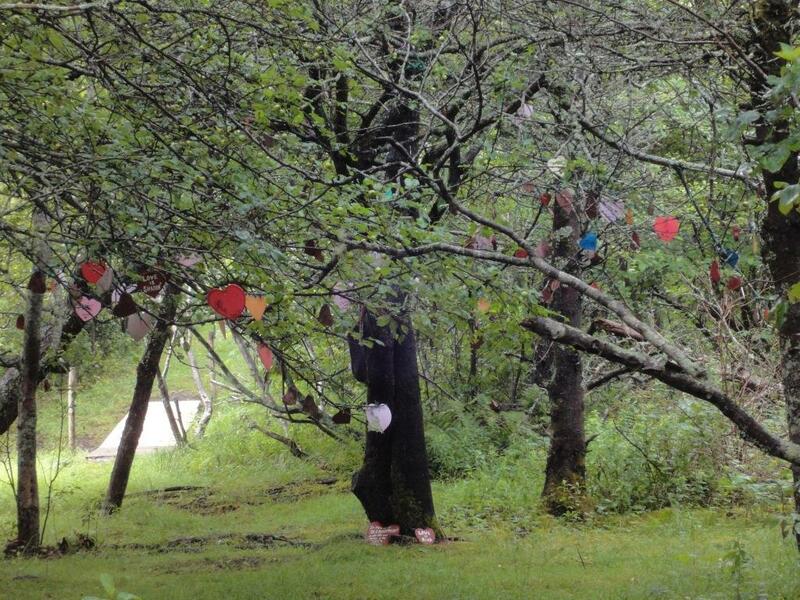 The next stop was a lovely spot that a local family has opened to the public. It’s a lovely path that they mow and there’s a tree that they invite people to a heart in memory of a loved one. There are benches along the way and upon arrival, there is a lovely view. 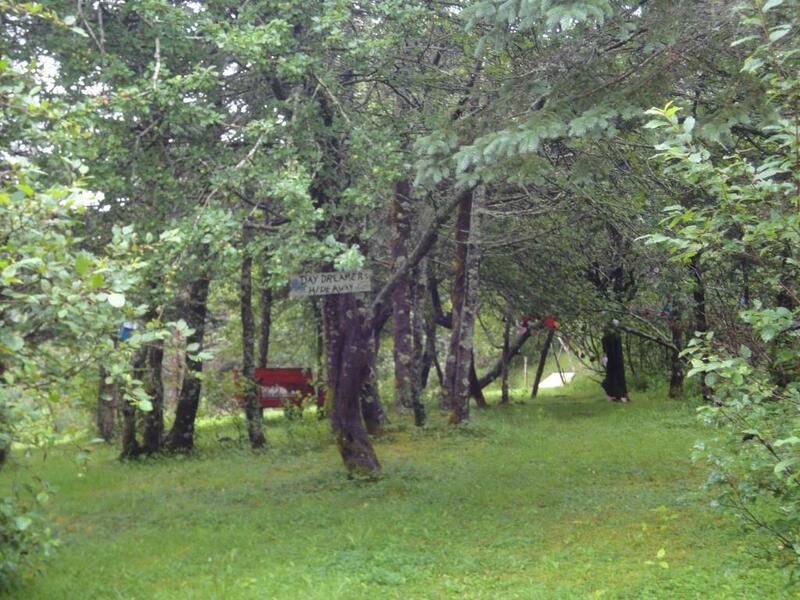 There are two little buildings that look like vacation cabins, benches and a hammock. It’s a little kitschy, but the owners’ sentiment is truly genuine. The channels between the island and the neck have strong currents when the tide is moving and sometimes the ferries have to point 30 degrees to the line of travel to compensate for the current. 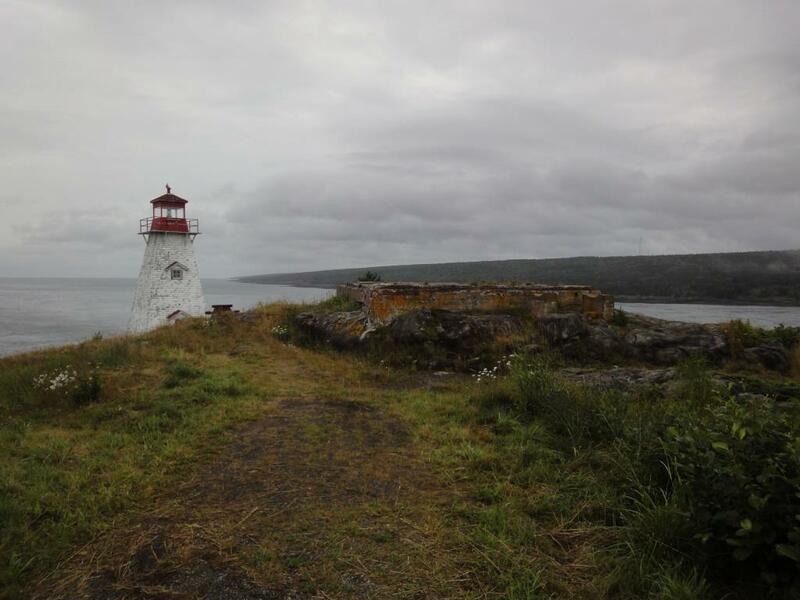 Taking the ferry to Long Island, I took the little track to Boar’s Head, a lighthouse on the point. As you can see from the pictures, it was a beautiful place. I continued on down the island to the ferry to Brier Island, but instead of crossing, I stopped at Lavena’s Café. 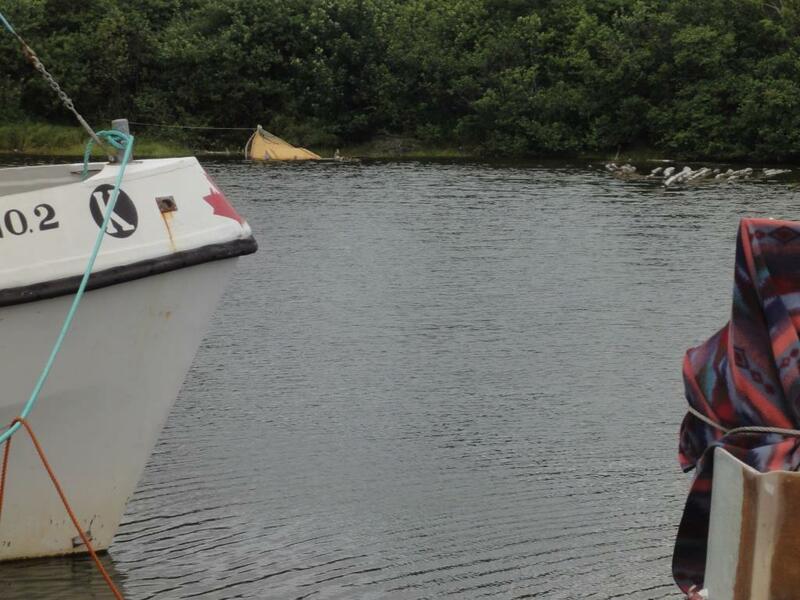 This little restaurant was started by a couple with generations in fishing. It was perhaps the best seafood I had the whole trip! Over an hour and a $5 ferry ride from Digby, there is a sign suggesting reservations for dinner. And with a delightfully full belly, I headed towards Halifax via Grand Pré (see “Dark and Dreary Be” for more on that historic place). No, the tides aren’t firing on me. A tidal barrage is a unique way to harness the power of the tides to produce electricity trapping water after a high tide and running it through a turbine as the tide changes. In 1984, Nova Scotia Power built such a system in Annapolis Royal. And unlike the Open Hydro experiment in 2009 that was destroyed after only a few cycles, this one is still running. The history of this particular project is an interesting one. Like all large projects, there is always some environmental impact, but in this case, the impact mitigates the impacts of a previous project. In the 1960s, the bridge across the Annapolis River at Annapolis Royal was in need of replacement. Nova Scotia at the time was finding that it was cheaper to build a causeway than a bridge, so that’s what they did here. And it had to be a very broad causeway because it had to stem the tides of the Bay of Fundy that at the time were causing the river level to change 25’ each tidal cycle (which is about 6. 25 hours). Because the river still flows, the causeway (which is essentially a dam) needed a control gate to let the water out. The Agriculture Ministry controlled the gate and essentially tried to keep the level stable. You can imagine that there was a HUGE impact on the ecosystem of the former estuary, now river. It became a freshwater body instead of an estuary and of course the fish community and grass community that was based on salt water all died and were replaced with freshwater fish and grasses. 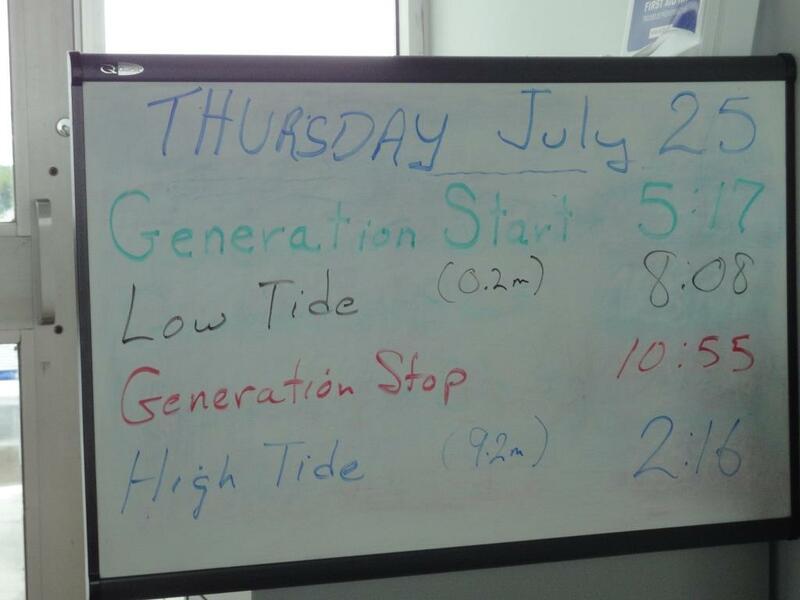 After the “energy crisis” of the 1970’s, Nova Scotia decided to experiment with tidal power. They took a current straight flow turbine design that was 2 meters in diameter and expanded it to 7 meters. They then had to design it for a saline and silty environment which means making it out of stainless steel and sealing the bearings so the silt wouldn’t get in and wear them out in a week. They also had to design it to take varying flow rates. Instead of trying to moderate the high flows which would have reduced the power output, they designed the generator into the turbine and are able to keep the speed of the turbine steady at 50 RPM by changing the power output. When there is high flow, the turbine is required to put out more power and as the flow drops, the turbine puts out less power. The power company now allows about 800,000 cubic meters of water to flow up the river as the tide comes in. When high tide is reached, the control gates are closed. As the tide goes out and the water level on the seaward side of the causeway drops, the wicket gates at the turbine open and water starts flowing through the turbine. As the water on the seaward side drops the “head” (the difference between the water levels) increases and the power output increases. The turbine continues to run until the difference is less than 6’ (the difference required to effectively operate the turbine). The level change is also limited to 2’ (a far cry from the 25’ of old!) as people are now relying on its stability. All in all, it’s a beautifully simple and effective form of production. Add to that the fact that it has been in operation since 1984 (with regular maintenance, of course) and you have a real success story. With new run of the river turbines, the potential to produce real power seems within reach. As we saw from the 2009 experiment, it’s not always that simple, but considering that the tides in the Bay of Fundy represent the movement of 160 billion tons of water each tide cycle—4 times the estimated flow of all the rivers in the world—it seems worth pursuing. For a little (very little, I’m afraid) more on this project, go to: http://www.nspower.ca/en/home/aboutnspower/makingelectricity/renewable/annapolis.aspx. 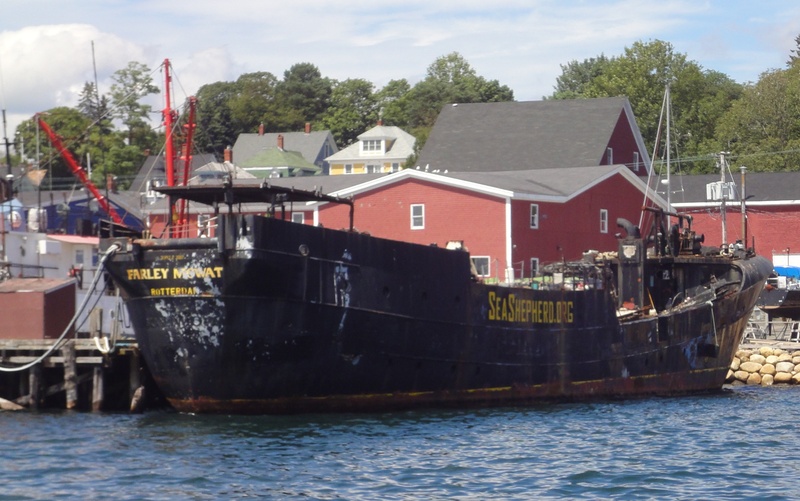 You can also go to http://fundyforce.ca/ for more on the larger project near Parrsboro. I grew up listening to Peter, Paul and Mary’s rendition of “Springhill Mining Disaster” but I always thought it was something that happened in the past, not in my lifetime (demonstrates how carefully I listened to the lyrics!). When I found out there was yet another mining museum in Nova Scotia focused on the Springhill mine and the “bump” that was the disaster, I had to go. One of the most riveting things in the museum was short CBC documentary on the anniversary of the disaster. There were interviews with two of the 7 survivors who spent 7 days trapped in the dark without food and with very little water. The disaster was a “bump” which is a common occurrence in mines. When material is removed from the mine, it creates stresses in the geology. Periodically there is movement that relieves those stresses. In the case of the 1958 Springhill bump, the floor and ceiling came together, crushing many of the miners instantly. The other highlight was the tour of the mine. It was a different company and shaft as the original mine was closed after the disaster. The new mine was opened in 1963 and closed again in 1973 when coal prices dropped and the mine, which had small seams which were difficult and expensive to mine, was no longer economically viable. The shaft that we go down is very different from the shaft the miners went down. 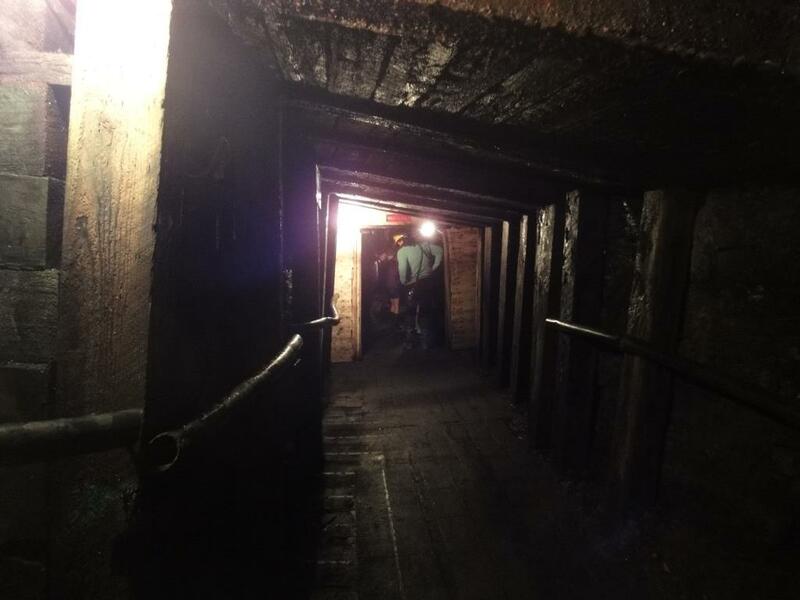 The ceiling has been raised to between 5.5 and 6.5 feet, the floor has been covered with asphalt shingles so feet don’t slip and the lower part of the mine is filled with water which keeps the air more humid and much cooler. I can’t imagine what life would have been like. The only power tools they had was a coal saw that they used to undercut with and dynamite to blast the coal away from the undercut. And they never were able to stand up straight. Had I not been planning on meeting Jen Clarke for an evening of theater in Parrsboro, I doubt very much it would have been on my itinerary. And that would have been a shame! This time town has a huge variety of things. It started with a wonderful little hostel, the Mad Hatter. While at first a little uncomfortable because I entered through the owners’ kitchen, I came quickly to love the place and the wonderful proprietress. The bed was comfortable and I got a full nights sleep for the first time in some days. Then came the food. A new restaurant had been opened that week by the owner of the local high end B&B. Jen’s lunch was very good so we tried dinner. Blackened Halibut. With lobster.Wow! After dinner was a wonderful production of the play, “Diligent River Daughter,” based on a novel set in Parrsboro. The production was terrific and the space quite unique. The stage was triangular and at ground level with seating angling up and away. I’m not a theater critic, but I found the shape allowed the director to easily change the impact of a scene by moving it on the stage. By having the stage on the ground, there wasn’t a physical delineation between the actors and the audience. 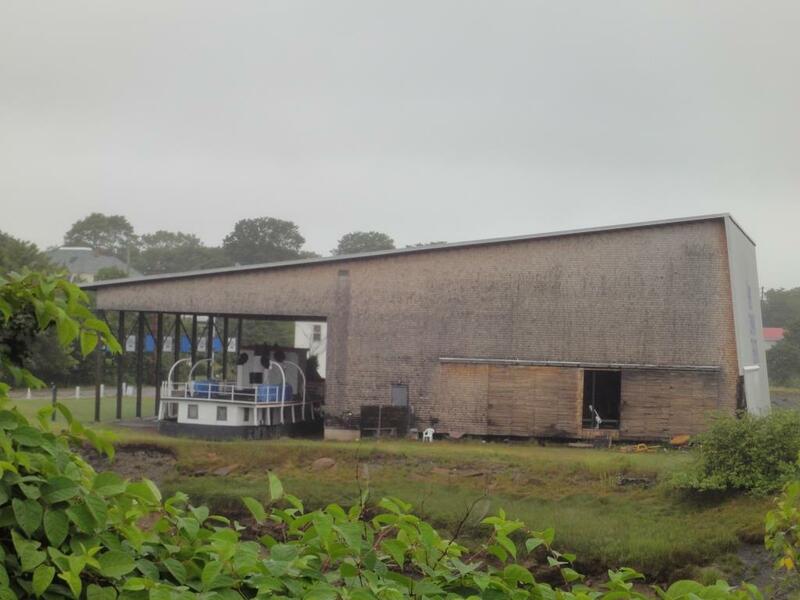 This was a new stage (about 2006) and had to be unique to replace the old one which was literally the working deck of a boat that was dragged up to the site! The boat is still there and has been incorporated into the covered space outside the theater. The next day was a busy one. 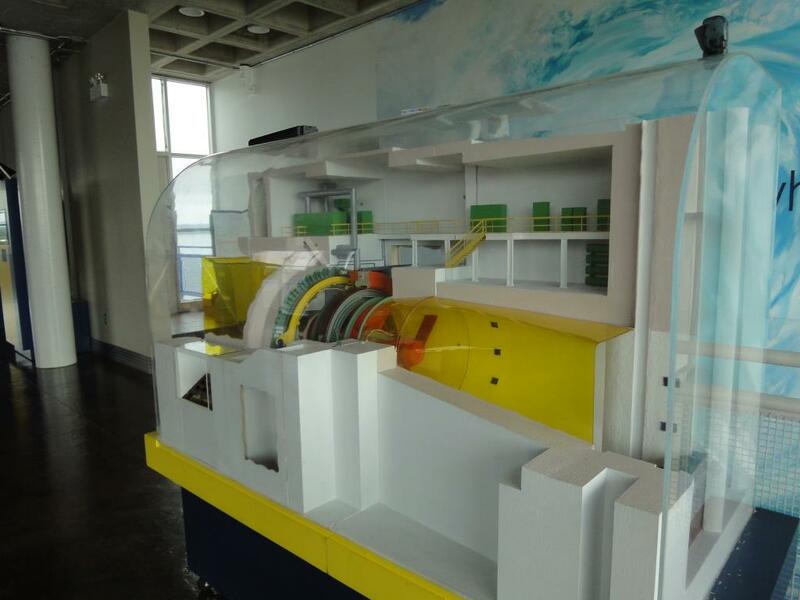 I drove to the visitors’ center for Force, an organization helping develop tidal power. They provide the space and infrastructure so developers can focus on turbine design. The first experiment in 2009, a run of the river turbine, only lasted a few tide cycles before being destroyed by the currents! There was not much to see at the center, as the 4 new developers are still in the planning stage, but it will be interesting to watch over the next years. For more information, go to http://fundyforce.ca/. There was also a Geology Museum and I did wander through. I’m afraid by the time I did, my brain was pretty full! There was a wonderful animation of the movement of land masses on earth over its lifetime. Very interesting! Several times Parrsboro was very close to Morocco! Who knew?